The weather in the Denver, Colorado area swung from unusually rainy + moderate temperatures to mid-nineties in the blink of an eye. When it is this hot, I prefer to grill rather than use the stove or oven. This includes side dishes and dessert if I am feeling adventurous. As I was carrying a rather large platter of fruit to the grill my daughter exclaimed, “Why are you grilling fruit?” What may seem like a rather silly idea actually creates a fruit salad that is akin to pie (without the crust) in the matter of minutes on the grill rather than an hour in the oven. And then placed them on the grill over medium-high heat for 3-4 minutes per side. 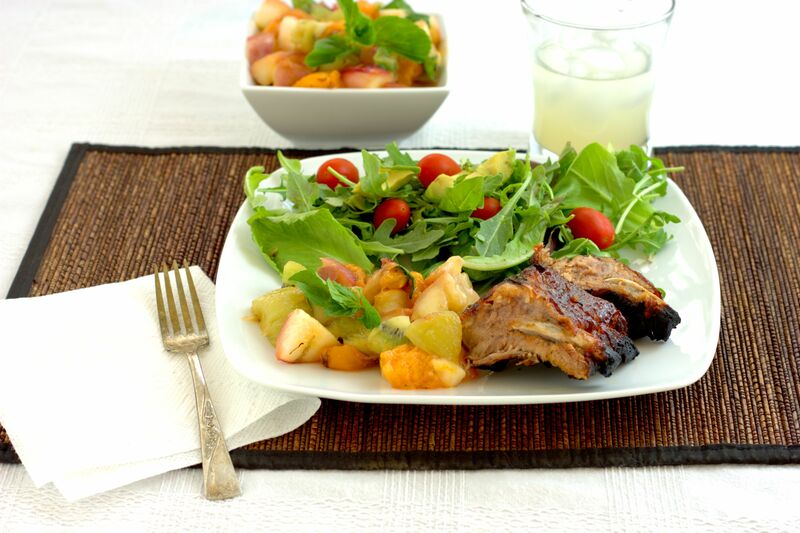 The grilling brought out the sweetness of the fruit and mellowed the kiwi. 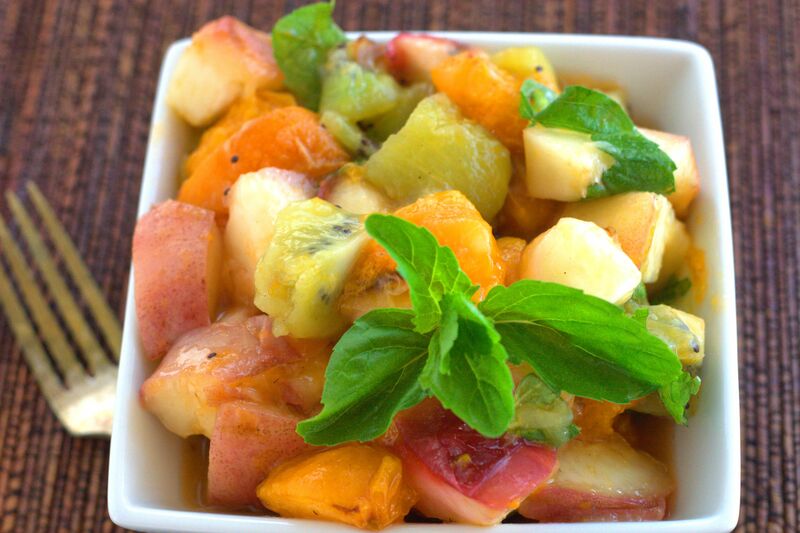 The juices from the fruit, mixed with a dash of maple syrup, truly made this grilled fruit salad taste like pie. I say go ahead and serve it guilt-free as a side dish and then have a second helping for dessert (perhaps with a scoop of vanilla ice cream, though I guess that would negate the guilt-free part). Preheat the grill to medium-high heat. 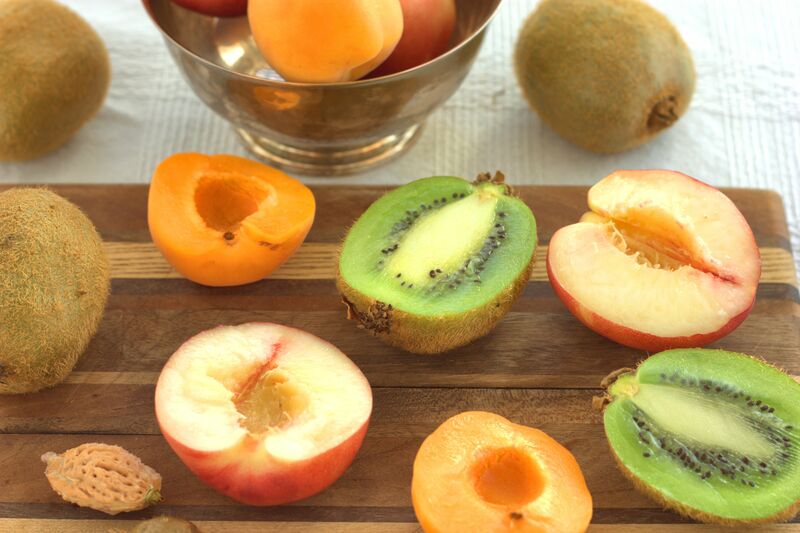 Halve the white nectarines, apricots, and kiwi fruit. 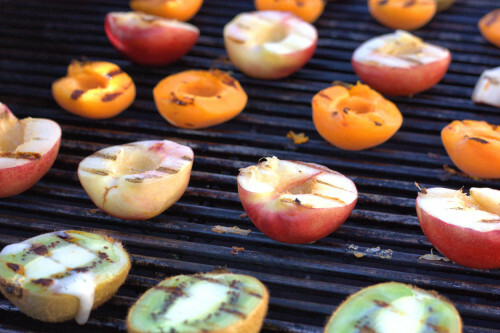 Remove the pits from the nectarines and apricots and then placed them on the grill. 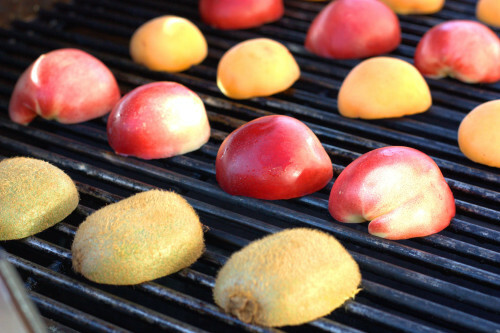 Grill for 3-4 minutes per side, or until grill marks appear and fruit begins to soften. 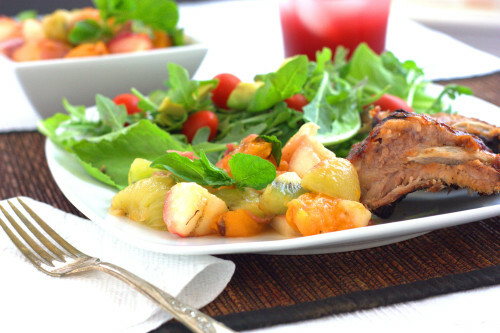 Remove from the grill, scoop the kiwi fruit from its skin, and then chop all of the fruit into large chunks. Place the chopped, grilled fruit in large bowl and stir in the maple syrup and mint. Serve immediately; refrigerate any leftovers. This entry was posted in Appetizer, Dessert and tagged fruit. I love grilling fruits! Maple syrup is also a huge weakness of mine. This recipe sounds so tasty; thanks for sharing it! I couldn’t resist adding the little bit of extra sweetness with the maple syrup :). 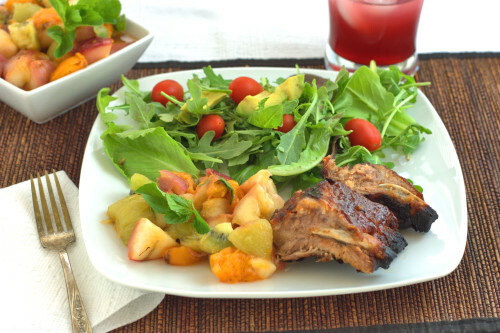 Love all the different fruits you grilled in this recipe, sounds delicious! I think this sounds absolutely wonderful. It seems like grilling would bring another flavor dimension to the fruit. We’re definitely going to be trying this! I agree, Michelle – I am open to trying to grill just about anything.